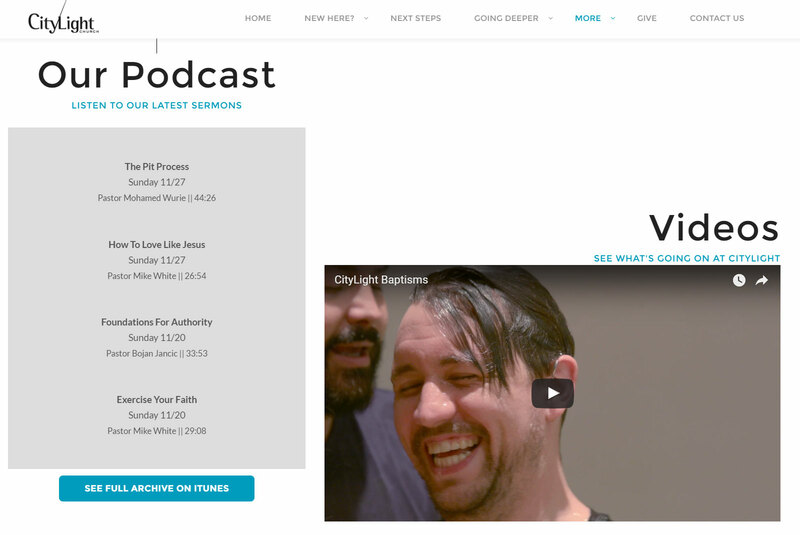 The CityLight website is a wonderful ongoing project that combines development of the Wordpress based site, graphic design for events and printables, as well as maintaining the weekly podcast. Though CityLight is in New York City, and we are based in Bluffton, SC, we are able to keep in constant communication to make sure that all of the visual elements and details of their services and events. This is a perfect example of how we can harness the power of the web to create a better web based experience. The homepage features a large hero slider, along with a psuedo single scrolling page. 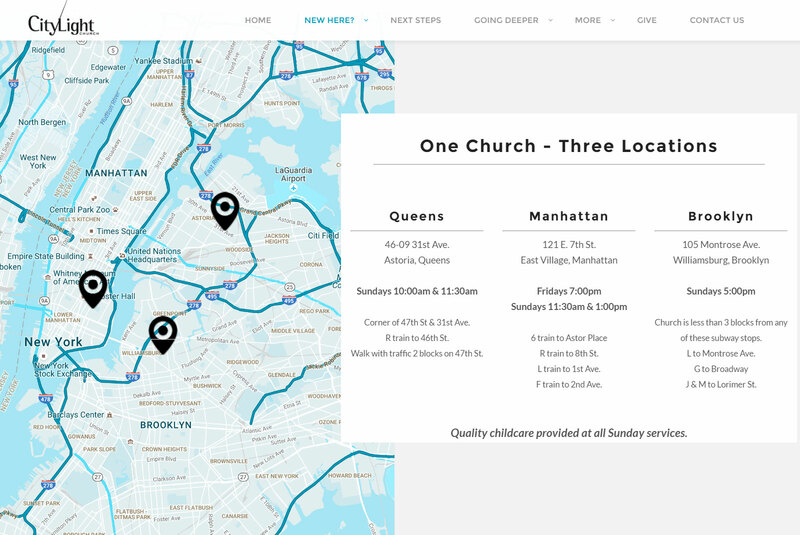 The homepage also contains basic information about the church, the church's mission, upcoming events, and a newsletter signup section (which follows the footer across all pages). This allows us to communicate to both users and search engines quickly and effectively. The Plan A Visit page was essential for CityLight to be easily readable and accessible. Therefore, we placed links in both the header navigation, as well as in the body of the homepage. 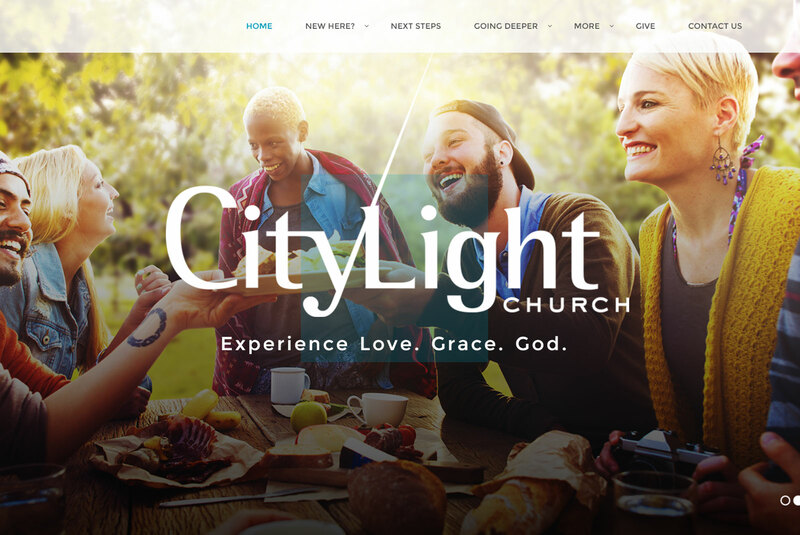 The page offers a quick synopsis of what visitors can expect as a CityLight service, as well as an interactive map of all of their locations and services times. Twice a year CityLight offers Life Group meetings where people gather together to learn and spend time together. 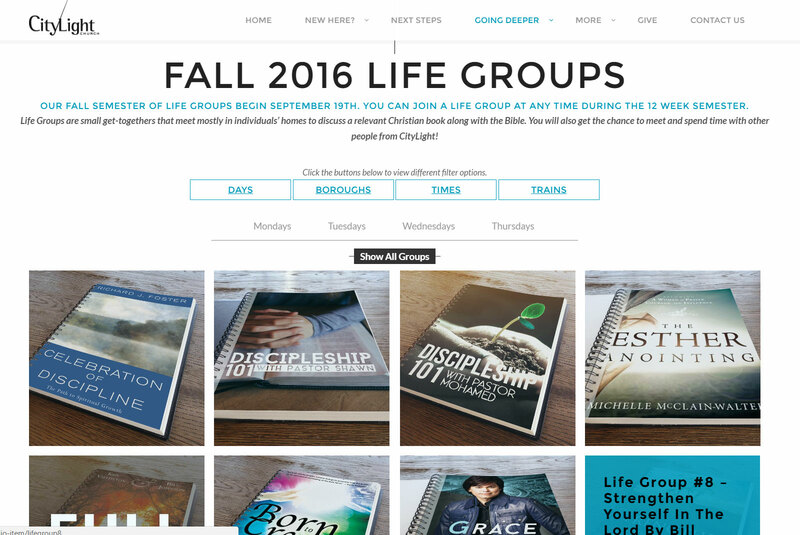 To streamline the sign-up process we created a webpage that displays all of the groups that can then be filtered based on meeting day, time, or borough. The titles then also link to Amazon pages for group members to order the books and the sign-up page created through the church's database system. Each week we are sent recordings of the pervious Sunday's sermons through dropbox. We then process them through Adobe Audition with noise reduction, compression, and EQ. Then we upload the mastered mp3s to their host and update the podcast XML file to notify iTunes and the media page on the website.